Yesterday mention was made on this site of the ocean of bizarro, shoestring-budget obscurities pouring out of the Anglophilic countries circa 1978-82, many of which are slowly being brought back to consciousness thanks to mp3 blogs, tribute sites and comps like Hyped2Death’s MESSTHETICS and HOMEWORK series. 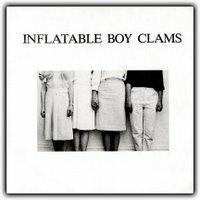 One such record I remember quite well, but never owned until I found this web site & scooped up all five tracks, was the darkly weird INFLATABLE BOY CLAMS 2x45. KFJC, my teenage radio station of choice, used to play the novelty track “I’m Sorry” from this set all the friggin’ time, and the first time I heard it, it was my favorite song the whole rest of the day. Then I’d hear it three more times a day & the sheen wore off fast – and until last week, I hadn’t heard it in over 20 years (!). “Skeletons” sounds like the rarely-glimpsed side of 45 GRAVE that was keyboard-heavy & proficient in dark, campy cabaret rock. It’s a little goofy, but jarring and endearing nonetheless. The band were part of the small scene that sprung up around San Francisco’s Club Foot circa 1980-81, a scene that existed on the fringe of the far more extreme FACTRIX/MONTE CAZAZZA/SRL stuff that was big in play at the time & was certainly a ways off from FLIPPER, THE LEWD and their misanthropic ilk. If they’d been from LA, their pals would likely have been the LAFMS crew like MONITOR and BPEOPLE. I’ve never heard PINK SECTION (to my knowledge), but two members of that band were in the Clams as well. Lots more can be learned at the aforementioned Inflatable Boy Clams tribute site. They must have been together only long enough to record this one session, because a band with four females making their own off-beat, deliberately tuneless racket should have been a hot enough property for at least a Subterranean or even a Rough Trade record deal, wouldn’t you think? The more I listen to these tracks, the more they transcend the kitschy novelty aspect, and head toward something a little more timeless and interesting. Let’s reevaluate this thing again a few years from now, what do you say?